Looking for a new place to live? Have I got a deal for you: Single family home, good school district, 18,930 square feet. Did I mention it’s a former military base that housed Nike missiles from 1960 until 1966? Yes, this former missile site can be yours for just half a million dollars. 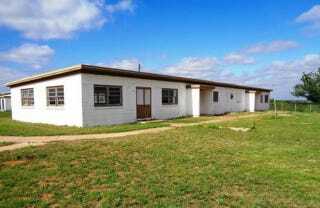 The property includes nearly 12 acres in Abilene, Texas, and would have been a vital line of defense against any missiles aimed at the United States during the Cuban missile crisis. The property has a high-security chain link fence, but anybody looking for an underground bunker should search elsewhere. The property was originally selected by the US Army as a site specific location for a Missile Site because of the line of sight capabilities. From the property you have 360 degree views of the surrounding country and Lake Fort Phantom. Property was professionally engineered, sculptured and constructed through Federal Contracting efforts by the US Army Corps of Engineers. There is not an underground bunker or missile silo. All buildings, except building 10, are constructed of concrete block. Last spring there was a hail storm that passed through the area causing moderate damage to the roof systems. Due to the leaking roofs there are areas where the sheet rock ceilings and insulation have fallen into the floor. The dropped ceilings are not a problem because when each building is renovated all the ceilings and insulation will need to be replaced to accomplish current code requirements for insulation. Ooh, an off grid family compound! Sounds like fun and not at all like a cult!